The first floor gallery and dining room of The Elms display a series of ten paintings depicting scenes in the life of Scipio Africanus and the accomplishments of the Corner family. Completed by several Venetian artists, the paintings were originally commissioned for the interior of the Ca’ Corner in Venice. Jules Allard acquired the paintings from the Ca’ Corner in the late 1890s and later sold them to Mr. and Mrs. Berwind. In 1962, the six overdoor paintings were sold at auction; in 2004, the Preservation Society re-acquired four of them. The remaining two paintings were acquired in 2012. Hyacinthe Rigaud painted this portrait of Charles III Ferdinand, Duke of Mantua in Paris in 1705. One of the most important painters during the reign of Louis XIV, Rigaud became the official court painter in 1688. Mrs. William K. Vanderbilt is believed to have acquired the painting for her collection at Marble House from the dealer Asher Wertheimer. Giovanni Antonio Pellegrini created this painting Minerva and Immortality for the library of the Ca’ Pisani in Venice in 1721-22. It was acquired in Paris for Mr. and Mrs. William K. Vanderbilt in 1892. One of his earliest recorded works, this oil on canvas painting was created by Gilbert Stuart around the year 1770. 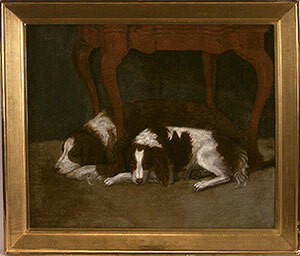 It depicts two spaniels resting beneath a serpentine tea table. Stuart is recognized as one of the foremost portrait painters of the late 18th and early 19th centuries. Richard Cosway painted this portrait of his wife Maria Hadfield Cosway around 1785. Richard Cosway was the principal portrait painter of the Prince of Wales, later George IV. His wife, Maria H. Cosway was also an artist, and exhibited at the Royal Academy in the 1780s. This oil on canvas marinescape depicts a New York Yacht Club Regatta off Gloucester, Massachusetts and is signed by the artist, Fitz Henry Lane. Thomas Worthington Whittredge painted this oil on canvas view of the house of Bishop Berkeley in Middletown, RI. Whittredge was an artist of the Hudson River School, who found inspiration in the picturesque landscape of Aquidneck Island. Newport was an important center of the Colonial Revival movement, and Whitehall was an iconic site for architects and painters. Charles McKim, a key figure of the Colonial Revival movement published a photo of Whitehall, labeled the “old house at Newport” in the New-York Sketch Book of Architecture in 1874. This full-length portrait of Mrs. Harry (Elizabeth Drexel) Lehr was executed in Paris in 1905 by the artist Giovanni Boldini. Born Elizabeth Wharton Drexel, she was the daughter of Joseph William Drexel, partner of J. Pierpont Morgan, and Lucy Smith Wharton. She married Joseph Vinton Dahlgren in 1889 and following his death, married Harry Symes Lehr in 1901. In her autobiography King Lehr and the Gilded Age (1935), Mrs. Lehr describes how her new husband revealed on their wedding night that theirs was to be a marriage in name only, and that he was only interested in her money. After Lehr’s death, she married John Beresford, 5th Baron Decies in 1936.